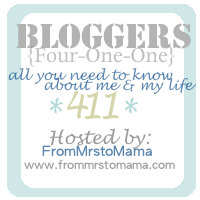 Blessings, Miracles, &Thoughts in Between: Blogger 411 Link-up! My reader has been filled with awesome Blogger 411 posts today so I thought I would jump on board and link up with Becky over at From Mrs to Mama! Welcome to anyone hoping over to the blog from the link up! I'm hoping to make some new bloggy friends from this link up! Leave a comment and I'll hop over and get to know you too! 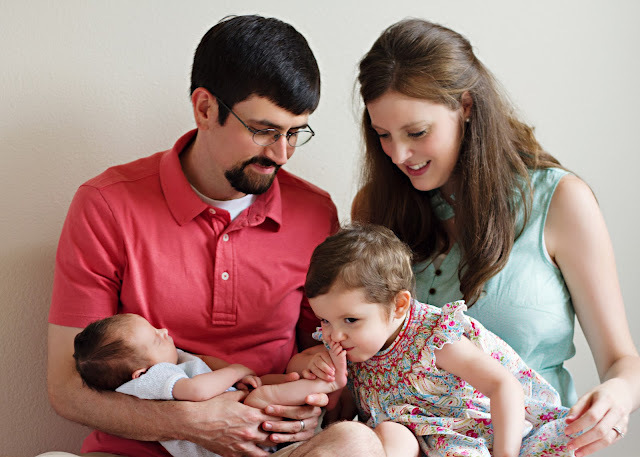 I started blogging anonymously back in 2008 when Alex and I started our journey down the path of fertility treatment. I blogged all of our failures and losses and then moved over to my new piece of the web when we announced our first pregnancy! Has my blog changed? Oh my YES! It started out as a pregnancy journal and then transitioned to your typical mommy blog. 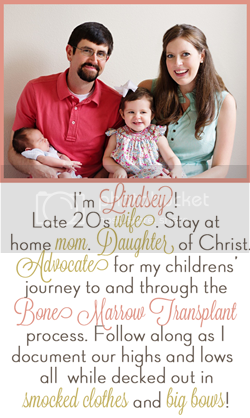 In June of 2011 it became a blog about Kate's journey through the bone marrow transplant process. Now, I typically blog about life with 2u2 (hello surprise baby!) and the ups and downs of walking through the BMT process again with Will. I did! I went to Mississippi State University in the great city of Starkville, MS! I adored my time at State - met me husband, made amazing friends, and graduated from an awesome International Business program! I actually have two degrees - a BBA in International Finance and a BA in Spanish! I am an avid fan of SEC football and am oh so loyal to my conference! I have done a lot of "vertical" traveling and have covered Eastern Canada, most of the US, every Country in Central America, a handful of Caribbean islands (Bahamas, Grand Cayman, French Martinique, Dominican Republic, and Aruba), and three countries in South America (Colombia, Ecuador, and Argentina). I can thank my former employer for the majority of my travel. Prior to becoming a stay at home mom, I spent the first 2.5 years of my career as an Internal Auditor at a major oil & gas company. My region covered the US, Canada, Central America, South America, and the Caribbean. So while I've been to many places, I have not vacationed in many! Conference rooms in the Bahamas look identical to conference rooms in Houston! However, I lived in Costa Rica in 2005 and did a study abroad program at the Universidad de Costa Rica in San Jose. It was an amazing time! We traveled the country on the weekends and I will always cherish my time there (even though my young and in love self missed Alex like crazy)! A big, beautiful vacation home in Hawaii. *Inconsiderate airplane "neighbors" - there is nothing more annoying than a Chatty Cathy talking on a 5 hour flight when all you want to do is enjoy an adult beverage and read your book in peace! I am a big red wine fan! But in the summer I really love beer - Blue Moon and Shock Top are my favorites this year. As far as non-alcoholic beverages go, I'm a major diet coke and coke zero addict. Read! I absolutely LOVE getting lost in a good book! Speaking of reading - I'm about to finish book #12 since June 5! Best Dressed Child. Because I have no shame in admitting that I would much rather shop for sweet smocked clothes than for myself! 11. What day would you love to relive again? My wedding day! It was amazing and so much fun! My parents did an amazing job throwing Alex and I a true New Orleans throw down of a wedding! Having all of our best friends in one place, drinking, dancing, and having a blast was wonderful! To this day my friends still ask when my Dad is going to throw us a wedding "reunion". Maybe a "we got two children through transplant and survived" party could happen. Hint, hint Dad! 12. If your life was turned into a movie... what actor would play you? Reese Witherspoon - sweet, Southern, and full of sass! Joe's Shoe Store in Mandeville, LA In high school! And I'm certain the majority of my paychecks went right back to Mr Joe so I could bring pretty shoes home! I also did some substitute teach and had a few internships. I never really worked much until I got my post-college job! 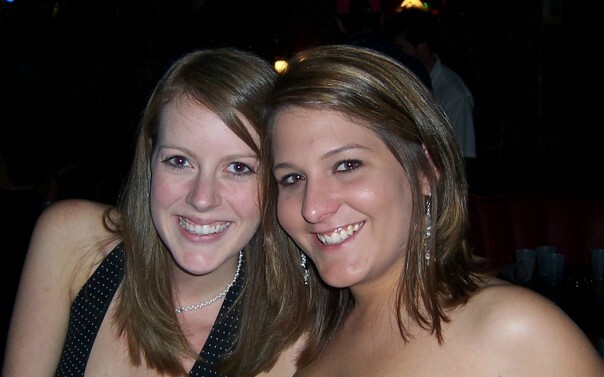 Me and my Bestest Bestie EVER Erin Beth! This was from 2006 I think? EB can thank me for playing match maker as she married the wonderful guy I set her up with him college! I cannot wait to squeeze her neck and lounge on the beach with her in 50 days! At Rick's in our glory days! Oh to be in college again! This was beginning of my Junior year I think - but I could be way off! All I know is that it was taken at some point between Summer 2005 and Fall 2007! Hawaii. Alex and I just love Hawaii so much and I would love to explore every bit of each island! Hike, lounge, snorkel! I want to do it all! The most current professional picture of the four of us! This is the "true life" picture! Kate smelling Will's feet and proclaiming that they are "nassy! sinky!". Ha! And OMG her hair has grown so much since this picture! Wow! I pray we have two healthy children who are 4 and 5 years post transplant, thriving, with no evidence of the hard battle they fought in the early stages of their lives! HEALTHY is my main hope and prayer! One time I was on the Tube in London and this old man got on and while he stood there, he reached into his pocket, pulled out a QTip, and started going after it in his ears. I about died. I am saying this because of #5, btw, lest you think this to be the most random blog comment ever. I've been reading your blog for a while now and it was nice to get to know some things about you! I'll admit, I have a Kate of my own, and the story of your Kate really pulled at my heart! I'm so glad she's doing well and pray for the same for Will! Love coke zero. Spending the 10K on our kids is definitely something us mom would do without hesitation! That picture of all of you is absolutely perfect. Coke Zero & Clueless- two things I couldn't live without, ha! This was fun to learn more about you, L! This was great! I think I might link up too! I always love keeping up with people from "back home" and it's fun to read things about you from when we weren't really "in touch" lol is that weird? Stalkerish, maybe? I agree with the spending of the ten thousand on our kids. Mine would so be there! And Clueless? no judgement because that movie is amazeballs.